The Monark 828 E is the world's most widely used test bike for fitness tests and worktests. It is easy to calibrate and just as easy to check when in use. You know that all the values are always accurate. Monark 828E Test Ergometer is the successor to the 818E. The Monark 828E Test Ergometer has a new softer design, a completely housed flywheel and strengthened frame. A new electronic instrument shows effective output in watts and heart rate using telemetry. The Monark pendulum balance ergometer is the world's most used test cycle for fitness testing at work. 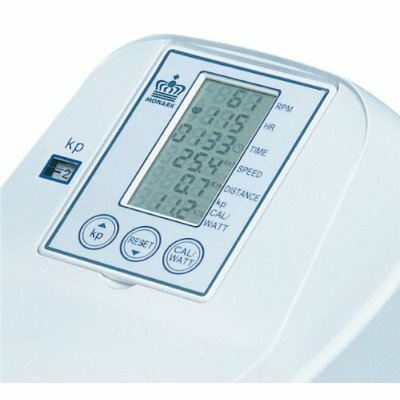 Order your Monark 828E Test Ergometer from FitnessZone.com today! The Monark 828E Test Ergometer combines a completely housed flywheel design with a strengthened frame and a pendulum-calibrated brake system to create the worlds most widely used cycle for fitness testing. It's the only test cycle approved by the U.S. Air Force and Federal Fire Departments. It has a new, softer frame design and new electronics that show RPM, time, speed, distance, calories burned, watts, and Polar telemetry heart-rate readings. The Monark 828E is the world's most widely used test bike for fitness tests and worktests. It is easy to calibrate and just as easy to check when in use. You know that all the values are always accurate. It has an electronic meter that shows pedal-turns per minute (RPM), heart rate in beats per minute (HR), cycling-time in minutes and seconds (TIME), intended cycling speed in km/miles per hour (SPEED) plus distance covered in km/miles (DISTANCE). In addition braking power can be set, giving a reading of calorie consumption (CAL) and power in watts (WATT). The braking of the wheel takes place mechanically via a belt that runs round the rim of the wheel. The two ends of the belt, of the Monark 828E Test Ergometer, are attached to a revolving drum to which a pendulum is fixed. This arrangement works as a pendulum balance which measures the difference in pulling power on the two ends of the belt. It is the successor to the 818E. 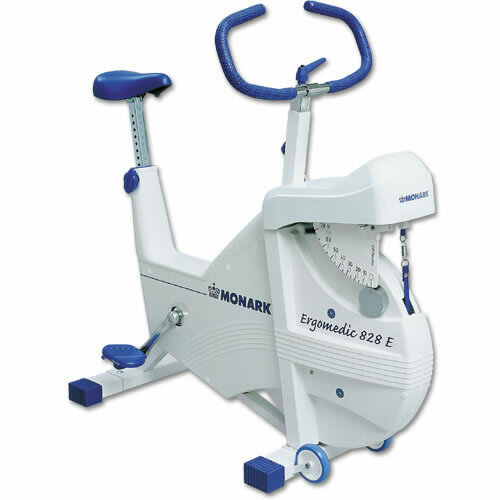 Monark 828E Test Ergometer is ideal for basic sub-maximal and max VO2 testing. Monark bikes are well known for their outstanding quality, durability, high level of performance, and accuracy in testing, with features designed to meet the rigorous demands of commercial gyms, rehabilitation centers, and active aging facilities. More importantly for users, the bike comes with aerobic test software for executing and analyzing aerobic tests, along with an adjustable brake system in which the brake force (resistance) can be set or read in kiloponds (KP) or Newtons (N), with a workload range of 0 to 7 KP. Other details include a tension knob that controls manual resistance, a heavy 48-pound flywheel, and adjustable seat and handlebars, and bottom wheels for easy transport. The 828E, which offers a maximum weight capacity of 275 pounds, measures 21 by 44.5 by 44 inches (W x H x D), and weighs 114.5 pounds. Intended cycling speed in km/miles per hour (SPEED) Distance covered in km/miles (DISTANCE). Order your Monark 828E Test Ergometer from FitnessZone.com today!